"High-energy works that bring jazz and pop: the soloists love them. David Chesky's music has no trouble opeening your ears. It is rhythmically alive, full of colorful sonorities, and more than a little brash in its fusion of jazz and classical elements. The three "Urban Concertos" here are high in pop-oriented energy and indebted to such masters as Stravinsky and Bartók, at times perhaps too much so. Chesky quites The Rite of Spring in the Piano Concerto and, obviously, in the Bassoon Concerto. Titbits from Bartók's Concerto for Orchestra crop up in Chesky's piece of the same name. These shows of affection aside, the pieces go about their business with ample personality of their own. The principal appeal of the Piano Concerto is its breezy propulsion, especially the solo part's perpetual-motion challenges in the finale. Elsewhere Chesky revs up the activity or goes deftly laguid. Whatever the demands, pianist Love Derwinger is a champion of all keyboard things he survey's, and the Swedish orchestra, conducted by Rossen Gergov, make their way audaciously through the score. The musicians are equally alert to the dark, mischievious corners of the Basson Concerto, which explores the solo intrument's extremes of range and character. In the last movement, the basson goes happily bersek to rythms clapped by the orchestra players. Martin Kuuskmann wails beautifully when he isn't taking the basson on wild Cheskian rides. In his Concerto fro Orchestra, the composer celebrates instrumental vaiety trough sleek transformation of themes and the juxtaposition of massive and delicate sonorities. ALong with Bartók and Stravinsky, Chesky pays respects to Holst. The ears are never allowed a moment's rest, compellingly so." The Concerto for Bassoon is sometimes aggressive, sometimes yearning, other times humorous and clever. 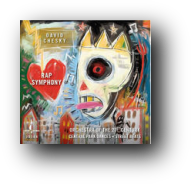 DAVID CHESKY: Urban Concertos =Concerto for Piano and Orchestra; Concerto for Orchestra; Concerto for Bassoon - Martin Kuuskmann, bassoon/ Love Derwinger, piano/ The Symphony Orchestra of the Norrlands Opera/ Rossen Gergov - Conductor. 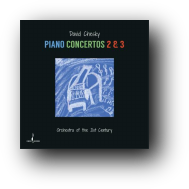 David Chesky has released a new album, titled Urban Concertos, that is very good music, well-played, and well-recorded. He's a pioneer in recording technique, a champion of new music and new musicians, and a fine musician, himself. During the last year and a half (maybe two years) David's written a Concerto for Flute, a Violin Concerto, a concert piece for female voice and orchestra that lasts about 12 minutes, a Bassoon Concerto, a Piano Concerto, and a Concerto for Orchestra.If the term hadn't been used before, I'd say this period has been Chesky's annus mirabilis, or "year of miracles".Many composers would have been happy to have written one or two strong pieces in the time he's written six. In one set of variations, the Concerto's first Movement swivels between Bartók-like and Stravinsky-like figures, and how Chesky can use them in a way that goes farther than either Bartók or Stravinsky did on their own. This music is not for everyone. It is pretty high-brow.What if you don't know Bartok and Stravinsky?Well, then you might enjoy this album because it is a nearly perfect recording. "Good job," to all the musicians in The Symphony Orchestra of the Norrlands Opera, and to Rossen Gergov who provided very tasteful and intelligent accompaniment. This is really a disc of music for the connoisseur.No hip, with-it household should be without it. 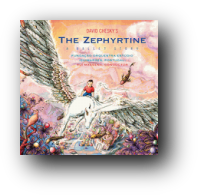 "In October 2005 this site reviewed an extraordinary SACD of music by David Chesky featuring his concertos for violin and flute. Now we have another terrific disk from the same source, called "Urban Concertos," with his Piano Concerto, Bassoon Concerto and Concerto for Orchestra, each one approximately 24 minutes in length. All three concertos are highly rhythmic and percussive, challenging not only for the featured soloists, but for everyone involved. The 24-minute Piano Concerto has two spiky outer movements separated by a nostalgic interlude that begins and ends softly after a jazzy middle section. The last movement is filled with large smashing chord clusters, all highly rhythmic of course, and punctuated by percussion and surprisingly this vivid concerto ends quietly. The 24-minute Bassoon Concerto is a welcome addition to the repertory, a true tour de force for the soloist, filled with whimsy, and the fabled bassoon opening of Stravinsky's Sacre du Printemps, one of the most famous bassoon solos in orchestral repertory, quoted several times. Chesky's Concerto for Orchestra is an imaginative exercise in orchestral writing and proves again that David Chesky is an important composer on today's music scene. I've never heard of conductor or soloists featured on this disk, they are first-rate throughout, as is the Norrlands Opera Orchestra. Sonic quality is outstanding, as we have come to expect from the label. Highly recommended!" Tom Chiu, violinist; Wonjung Kim, soprano; Jeffrey Khaner, flutist. Area 31, conducted by Anthony Aibel. Chesky SACD288; CD. "DAVID CHESKY writes concert works influenced by jazz and Latin music, and works in Latin forms with undercurrents of North American and European classicism. He has the luxury of releasing his music through a family-run label that specializes in classical music and jazz, but don't write his discs off as vanity projects. The music on this new one is deftly orchestrated and full of original ideas, and Mr. Chesky has enlisted superb players, including Jeffrey Khaner, the principal flutist of the Philadelphia Orchestra, and Tom Chiu, a New York violinist who has become prominent in new-music circles. The three pieces here - two virtuosic, lyrical concertos and a vocal work - combine a gritty sophistication with a street-level energy and currents of exotic folkishness. All three include flamencolike clapping and stamping, an effect that could grow tiresome if it weren't used so inventively, both as a quirky alternative to conventional percussion and as a tightly intertwined line of rhythmic counterpoint. The Violin Concerto begins with a consonant, naively poplike chord progression, but the bouncy opening quickly shatters into a spiky, vigorous deconstruction. Mr. Chiu gives its slow movement the shape and intensity of a dramatic monologue, and he summons considerable energy for the finale, which weaves 12-tone themes into rhythms and textures drawn from the last movement of Bach's "Brandenburg" Concerto No. 3. The Flute Concerto heads in different directions, often taking on an accent of mid-20th-century French urbanity but sometimes borrowing Brazilian moves as well. Its lyricism suits Mr. Khaner's sound, but he seems equally at home in the music's rougher moments, including its explosively rhythmic finale. Mr. Chesky's vocal writing in "The Girl From Guatemala," a setting of a poem by the Cuban writer and revolutionary José Martí, glides between Mozartean gracefulness and contemporary angularity. Wonjung Kim, the soprano, sounds comfortable at either extreme." "David Chesky is best known as a jazz musician who, with his brother Norman, runs an audiophile label bearing his family name. Don't assume that this disc of Chesky's classical works--or art music, or post-classical music, or whatever we should be calling it now--is a vanity project. This is memorable, involving well-crafted music in a highly individual, identifiable style performed with beauty and gusto in excellent sound. The highly engaging Violin Concerto features colorful, though light-scoring, memorable themes, essentially tonal harmonies, and rhythmic vigor. Right off the bat, Chesky wins us over with a bracing rhythmic figure that involves some of the orchestral musicians clapping in a vaguely flamenco style (shales of Carlos Surinach here). The general style is something like Michael Daugherty, without the comic books. the solo part sounds daunting, with rampant, rapid string crossings, but it's played with gusto by Tom Chiu (of the Flux Quartet). Chiu's tone can sometimes be scratchy, but this isn't Tchaikovsky's folks. The second movement, although it is not immediately apparent, is a Cuban DANZON, but not nearly as touristy as Copland's DANZON CUBANO, and the finale takes up very strong rhythms in what Chesky says is a commentary on Bach's BRANDENBURG CONCERTO NO 3, although it sounds to me more like deconstruction of something Handelian. The title, THE GIRL FROM GUATEMALA, given Chesky's background, calls to mind a certain Panama beach-dweller, but this concert aria is a world away from Antonio Carol Jobim. It's a setting of a text by 19th century Cuban poet Jose Marti, about a girl who dies of love. Chesky describes it to be containing "expressive flamenco vocal lines that flow sensually over a pizzicato orchestral texture propelled by the fervor of the PALMAS (the traditional hand clapping used in flamenco music" You won't confuse this with flamenco, though, the idiom is thoroughly contemporary, with a superficial resemblance to Villa-Lobos. Wonjung Kim sings the difficult vocal line with aplomb. The Flute Concerto, featuring the brilliant Philadelphia Orchestra principal Jeffrey Khaner, features the most sinuous, blatantly Latin melodic lines on the disc. If the Violin Concerto is accessible mainly through its rhythms, the Flute Concerto owes its appeal to melody as well as rhythm. The work calls to mind, in turn, Villa-Lobos, Jobim, Piazolla, and again Surinach, although the score draws not from them so much as from their common Latin-American sources. Anthony Aibel leads a crack chamber orchestra called Area 31--about which the notes are rather cryptic--in alert, vibrant, swinging performances that seem to convey all the color, excitement, and fun in these scores. It's a small orchestra recorded with absolute clarity and firm spatial definition in a small room; you are seated in the middle of the hall in the beautiful sound recording. In every respect, this is irresistible." "David Chesky fuses diverse influences into a musical language all his own"
"If you love classical music, you have got to hear Chesky's new recording-and if you don't love classical music that might be because you haven't heard anything as fresh and lively as Chesky's compositions"
"Fusing the European conservatory tradition with Latin and jazz elements, they flow together like a single train of thought." to write up the trip?" "I think that Chesky deserves to be thought of as among the serious composers of his generation. The book may not be closed on the stature of David's music until most of us are gone. He might be judged a "great" composer, like the insurance executive Charles Ives"
"David Chesky Area 31 (SACD288) includes concertos for flute and orchestra, violin and orchestra and The Girl from Guatemala for soprano with orchestra, all by David Chesky. The ensemble, Area 31, conducted by Anthony Aibel, is devoted to the recording and performance of new music works that challenge the assumed confines of modern composition. They certainly do an admirable job on this wonderful music, which combines the concerto tradition with American jazz, Latin and Brazilian rhythms, Baroque counterpoint, and enough energy to drive a locomotive. Jeffrey Kahner performs the virtuosic concerto, which was written in 2003. The work is fun, probably due in no small measure to Kahner?s ability to make it sound easy. Although the technical patterns are anything but that. This is highly-recommended recording should be on every flutists' shelf." Piano Concerto. Bassoon Concerto. Concerto for Orchestra. Love Derwinger, piano; Martin Kuuskmann, bassoon. Symphony Orchestra of the Norrlands Opera, Rossen Gergov, conductor; Nicholas Prout, engineer. Along with Christopher Rouse, CHESKY is one of the most gifted concerto composers current active. An earlier SACD, Area 31, offered examples for violin and flute; the pieces starring piano and bassoon are even better. CHESKY's concertos not only fully exploit the unique character of the solo instrument but also present a compelling dialog between the protagonist and larger ensemble. The piano work, with its angular nervous energy, evokes the three Bartók concertos. Love Derwinger's confident, muscular technique serves the music well. The Bassoon Concerto features exceptionally idiomatic writing for the soloist - CHESKY revels in the instrument's flatulent low register as well as the saxophone-like high range (with several references to the high-flying opening of The Rite of Spring). Martin Kuuskmann, a specialist in contemporary music for bassoon, has an appealingly robust tone with wide vibrato. The Concerto for Orchestra, as expected, is about individual and ensemble virtuosity, and the Swedish orchestra is up to the task. CHESKY pays homage to many large-scale twentieth century works, including Bartók's peace of the same name as well as (more subtly) music of Holst, Richard Strauss, Stravinsky, and others. Jazz and Latin influences-flamenco handclaps are recurrent feature- are apparent. But mostly, one's impressed with the constant high level of invention. The sound is fast, refined and very detailed, with realistic instrumental timbres. The 4.0 surround version (Chesky's no friend of the center channel) is judiciously executed with no apparent output from the rear speakers at the listening position-a kind of enhanced stereo. The two-channel DSD program is nearly as dimensional and coherent." "Piano, Orchestra and Bassoon Concertos"
"David Chesky deserves major props for writing one of the best "classical" pieces yet to incorporate the electric guitar--a wonderful instrument that lots of modern composers use, mostly terribly. Leonard Bernstein managed it, and a few others, but Chesky's concerto is at once excitingly virtuosic, cogently structured, and true to the instrument's roots in rock and popular music. It's exceptionally well played by Bryan Baker, who in the notes says he spent eight hours a day learning it. The effort shows, but only in a good way. "Urbanicity and The New York Variations are ballets, which explains their rhythmic charge, but not their eclectic mixture of idioms and references, which are pure Chesky. Both have three movements. Urbanicity lives up to its title with a vengeance: the music might strike some listeners as overly relentless, but The New York Variations has more variety and (it seems to me) a wider expressive range. The performances, as in the concerto, are tip-top, and the sonics stunningly lifelike, with the electric guitar particularly well-balanced. A very enjoyable release by a distinctive compositional voice." "Composed by David Chesky, with 24 year-old Bryan Baker in the electric guitar chair, this very contemporary and arguably landmark orchestral work incorporates numerous cultural threads-including bits of, funk, metal, and '60s pop and rock-with Baker's exciting and virtuosic playing showcased throughout. This challenging but ultimately accessible music rewards with repeated listening." "These are all three exciting and super-contemporary works "
" Dense, busy, occasionally manic, yet always driving, always compelling"
"The Concerto for Guitar and orchestra will surely generate some controversy, melding as it does acoustic orchestra with that bete noire off all things rocks musical instrument of choice"
"David Chesky comes of age as a 'classical' composer with these two concertos... [his] writing for woodwinds, bassoons especially, may bring to mind Ginastera or Villa-Lobos, but with greater transparency in the orchestration... There is real substance here, and a dynamic creative personality at work. Sharp observers will notice a distinct similarity between the name of the composer on this recording and the record company involved. No one, though, would ever accuse the audiophile label Chesky Records and its founder David Chesky of conspiring in a mere vanity project, in whose packaging alone - with credits and booklet-notes blurring into a design both cryptic yet intuitively coherent - one can see the mind of someone who never really breaks the rules but certainly bends them to his own will. Although none of the three concertos here departs from time-honoured form, the contents reflect a number of ideas culled from other musical influences, particularly rock and jazz. Right from the opening Concerto for violin, cello and orchestra we're swept up by a sense of breathless propulsion. Chesky's rhythmic contrasts remain fairly conventional, but his sense of instrumental colour tends to peek into hidden corners. Borrwoeing much from rock music's 'noise' aesthetic, the music's timbral ornamentation often sounds as close to amplified distortion as you're likely to find on an acoustic instrument. From jazz Chesky clearly retains a sense of improvisational immediacy, which violinist Tom Chiu and cellist Dave Eggar both deliver with a potent combination of close intensity and fluid grace.As fresh and vital as this music sounds, though, much of its underlying quality harks back to pre-Classical times. One gets the feeling that if Vivaldi somehow heard Chesky's concertos, he might find them the strangest pieces he'd ever heard - but he'd always understand what was going on"
"String Theory is a seven-minute rhythmic fantasia for strings and percussion that’s over before you know it. Chesky is a very serious composer, and like most of his music this little piece, although ostensibly based on his characteristic blend of trendy jazz/rock influences, hints at darker things. There’s a sardonic edge, for example, to the slow movement of the Violin Concerto No. 2, while that of the Cello Concerto is positively spooky (in a good way). The three concertos included here, for violin, cello, and the two instruments combined, share a similar stylistic basis. All adopt the standard three-movement form. None is terribly long, taking from fifteen to nineteen minutes. The outer movements feature hard-hitting rhythms similar to what we encounter in String Theory, while the central slow movements are highly varied. The finale of the Cello Concerto, a slightly off-kilter waltz, is particularly arresting. Indeed this work, the largest of the three concertos, is the most impressive piece on the disc, and in my opinion one of Chesky’s major achievements. It shows that his style has real range; the possibility to expand atmospherically and emotionally beyond its “urban cool” roots. The other two concertos are shorter and more compact, almost neo-baroque in character. The motor-rhythms in the outer movements bring to mind the relentless allegros of works such as Bach’s Keyboard Concerto in D minor BWV 1065. For this reason I wouldn’t suggest playing all three concertos at once. No qualms, though, about the performances. Chesky’s writing for solo strings offers plenty of opportunities for rapid runs and showy figuration, as well as islands of lyrical repose. 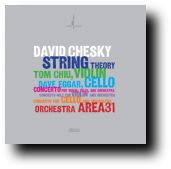 Cellist Dave Eggar and violinist Tom Chiu offer poised and polished accounts of some pretty tough passage work, and they are very faithfully balanced against the larger ensemble. The orchestral parts throughout are pretty much subordinate, save for some very interesting solo writing for bells, glockenspiel and other tuned percussion in all three concertos. There’s no question that Chesky has created a wholly special sound world for these works, one quite unlike any other. You might call it darkly energetic, with flashes of electricity. This music has integrity, and it gets under your skin. It’s also exceptionally well played and recorded. Chesky was on hand Saturday to introduce his composition and to receive the symphony's 52nd annual Composer's Award. The composition, with its jazz undertones, reflects the speed, pressure, anxiety and loneliness of hurried city life. With each beat, the concerto crowds you into the subway, as you hope to find a seat but are forced to stand. You can see the graffiti along the subway walls as the cars rush steadily, rhythmically through the tunnels. Chesky's music creates images of shoulder-to-shoulder crowds moving en masse to cross a busy intersection as taxis fly by and the traffic light blinks its warning that time is almost up. The concerto conveys the deep loneliness of strangers in a big city, staring straight ahead in their daily repetition of urban life. Chesky doesn't deviate from traditional three-movement concerto form of fast, then slow, then fast again, but he creates an energy that is "stretched to the max and on steroids," he noted. Chesky's concerto creates a syncopated, driving rhythm. So profound is the pounding beat of Chesky's composition that you feel the tension building and hope you won't miss your subway stop. "This is certainly among the finest piano recordings ever made." "Combines classical, jazz, and Chesky's quirky personality in a series of short vignettes that are quintessentially New York." David Chesky first made his mark in the music world as a record producer, issuing a series of highly-regarded audiophile LPs, among other things making available once again certain early stereo RCA recordings in superior pressings. In the intervening several decades, he has been enhancing his reputation as a composer with a distinctive voice, and I believe it's safe to say that once you've absorbed his style, you'll be able to recognize as his even works you've never heard before. The New York Rags comprise a collection of 18 rags for solo piano, all drawing upon people and places connected with "The Big Apple." From the opening "The New Yorker," Chesky will have you hooked. This ear-catching series is an enticing conflation of elements of Conlon Nancarrow, Dave Brubeck, William Bolcom, and others, combined in Chesky's inimitable way. A large part of the attraction of these pieces is the composer's ingenious use of bi- and poly-tonality throughout them. Some of his rhythms go ragtime one better, ramping up the rhythmic vitality of the typical rag a notch or two. Each rag makes its impact in a short time: Only one of these rags is as long as three minutes. Certain of them, including the "Broadway Boogie-Woogie," bring in other non-rag rhythms and patterns. Only occasionally does the energy level subside a bit, as in "Fifth Avenue." The composer explains his predilection for up-tempo pieces: "That's the way New York is. Everybody's fast." Chesky has also worked some musical puns into the pieces: Each of the rags named after the numbered streets and avenues (Fifth, Seventh, Fourth, Third) are based upon those respective intervals. And, indeed, "The Circle at Fifth" sounds as if he is traversing the circle of fifths. Chesky proves himself a pianist of considerable abilities in the execution of these works, none of which sounds in the least easy to negotiate. Unfortunately, the notes give no biographical information on Chesky, either as pianist or composer. Searching online, I discovered he studied piano with John Lewis (of Modern Jazz Quartet fame) and composition with David Del Tredici. Lewis's tutelage explains Chesky's adept execution of jazz rhythms throughout this music. The piano sound is exemplary, certainly no surprise from the producer of more than 500 audiophile quality LPs and CDs to date. "The New York Rags disc (there are 18 rags) is remarkable: Scott Joplin meets Nancarrow meets Domenico Scarlatti and Fats Waller. The hectic bustle of New York seems made into sound here (Chasins'l Rush Hour in Hong Kong came to mind also). Each has a title. Some are charming ("The Duke"), some more ominous ("Times Square", a dark beginning followed by unsettling polytonal harmonies). Gesturally, Chesky will begin them as a classic rag might with a brief, throw-away statement, but he transforms (transmogrifies?) it into something together his own. The pianism throughout is of sterling quality, be it in the evenness of No. 5, "Fourth Street" or in the crazy angularities of No. 6, "Third Avenue", the Bachian purity of No. 8, "Fifth Avenue" or the crystal clear sparkling articulation of No. 14, "kids You're Late For School Rag". The whole experience is less of a deconstruction of a form, more of an unraveling. The stuttering left-hand chords of No. 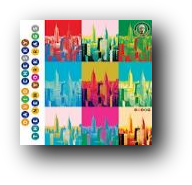 7, "Broadway Boogie Woogie" bring to mind electronic music, while the rather zany, mentally unbalanced "The Thanksgiving Day Parade Rag in 7/4" seems to exemplify all that is David Chesky. An intriguing trip into a most interesting musical mind." David Chesky's three new concertos redefine the role of the modern string soloist. Fusing classical concerto form with the modern harmonic language of American rhythmic jazz, these innovative works extend theoretical para-meters to realms reserved for the few pioneers who truly revolutionized their parameters, such as Hendrix, Parker, and Heifetz. Tom Chiu and Dave Eggar are by turns chamber soloist, free jazz experimentalists, and poetic sound abstractionalists who bring a volcanic rock-and-roll energy to these works as they transcend the typical concerto and race towards a potent visceral conclusion. Fiendishly difficult passagework and a new athleticism to the musical virtuosity as the soloists debate, collide, and duel with the orchestra and with each other. Throughout, Chesky's poignant juxtaposition of primitive power of urban groove and the elegance of classical refinement reveals the birth of a new genre of American music. So, is this just underserved hype by the annotator? No, I think not. All of the rhythmic energy of the rags transfers over to these concerted works as well. I don't doubt that the passage work is sometimes "fiendishly difficult," too, although how it would compare in that regard with some of the trickier technical passages in, say, the Tchaikovsky concerto I wouldn't be able to say without taking my violin in hand with the respective scores in front of me. I can certainly affirm that soloists Chiu and Eggar play these pieces with particular passion, precision, and aplomb, as do the instrumental forces backing them up. There is not much in them that I would call true "melody," but somehow these concertos don't seem to suffer because of it. This treasure chest of Chesky will delight many, but likely not all, of Fanfare's readers. If you are possessed of the disinclination to jazz as is my colleague James Altena, these won't be for you. But others will find them a joy from beginning to end, as I did. For you, I give both CDs not a Bronx cheer, but some sort of very positive New York whoop." This is invigorating music, to be sure. David Chesky's music is undeniably involving and is clearly born of a lively (feverish?) imagination. The first movement of the Concerto for Violin, Cello and Orchestra (as far removed from Brahms' effort as can be: it is one of Chesky's so-called "Urban Concertos") is febrile, buzzing continuously with nervous energy (the very colorful-literally-booklet notes refer to a "volcanic rock-and-roll energy" and, if hyperbole can be forgiven in publicity material, it gives you a basic idea). The two soloists here, Tom Chiu and Dave Eggar, work extraordinarily well together (they frequently operate in rhythmic unison). The music is engaging, and the second movement is no placid central plateau. Although the cello now begins by presenting longer lines, the restless staccato ostinati of the orchestra leave one in no doubt that the restlessness of the first movement continues across the movement break. The two soloists chase each other as if to highlight their inextricable nature here. The finale is the most primal in terms of rhythm of the three movements. Cascades of descending scales from the soloists punctuate the obsessive, pounding orchestral background. The Cello Concerto seems to replicate the same basic constituents of the double concerto: perhaps it is a tad less manic, but it is just as psychedelic. Dave Eggar confirms the positive impressions of his playing made by the Double Concerto. The stasis of the central movement appears suddenly and dramatically and is sustained to hypnotic effect before more motoric energy is unleashed in the finale. Finally, for the concertos, the Second Violin Concerto, which begins with a decidedly minimalist slant from the orchestra. The eloquence of the central movement of this concerto is positively delicious, especially given Chiu's silken tone, while Chiu is able to unerringly home in on the Bartokian spikiness of the finale. If I may quote my colleague James Reel from the November/December 2005 issue (Fanfare 29:2), Chesky's "general style is something like Michael Daugherty, without the comic books". That pretty much sums it up here, as well (Reel was referring to a disc that included the First Violin Concerto and the Flute Concerto), and it is particularly well illustrated by String Theory, which seems to be a vibrant celebration of life itself, albeit a rather hectic one. "A powerful demonstration of orchestral virtuosity." 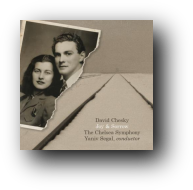 "David Chesky’s music is a gripping and original transfiguration of a culture and way of life brutally destroyed. His music uses a vanished past to evoke the possibilities of a Jewish cultural renaissance accessible to all." "Entitled “Joy & Sorrow”, David Chesky’s latest disc celebrates both Kletzmer and Roma music, melding it with Chesky’s trademark New York freneticism and even extending it to Delta blues. The result is remarkably multi-colored, from the almost straightforward village band of Betty’s March (adapted only by clarinet and violin interjections in Chesky’s own hand) to the more complex concerto and the shadowy Arbeit Macht Frei. One thing is certain: the extremes joy and sorrow are indeed here, in a mere 70-minute stretch of time. (...)This is a terrific piece, and appears here in a performance it is difficult to imagine bettered. With its high degree of craftsmanship, intensity of expression and excellent performances, this is a CD to enjoy again and again. "This fascinating and invigorating disc takes the Baroque concerto form as exemplified by Corelli and Vivaldi, and scoops into its formal shell composer David Chesky’s driving, powerhouse music. Gestures from the Baroque period are constantly referred to and reinvented. Chesky’s characteristic dense and chromatic polyphony touches on urban, Brazilian and Latin music as well as bebop and funk; the effect is to breathe new life into the old forms. It needs to be stated, I think, that there is far more to this music than immediately meets the ear: repeated listenings to the entire album have taught me that in no uncertain fashion. A tremendous release." "Chesky is a bit of a musical chameleon, genres including Latin, urban, rock and roll, jazz, and an underpinning of funk. That fluidity is in force in The Venetian Concertos, and as soon as you feel that you have an expectation of what will follow, there is a shifting of musical influence, so that while The Venetian Concertos can follow the guise of a contemporary classical music at times, it’s clear that Chesky is interested in an almost anarchistic assault on the genre. And that’s a good thing." "...Chesky takes off in virtuoso runs executed usually as one by his pick-up Orchestra of the 21st century, which leads to unexpectedly sad and beautiful private places." "I have also always believed Chesky to be sui generis when it comes to his work not just as a piano virtuoso, but also as a composer, especially a classical one. The moment he puts pen to paper, all notions of what his music ‘should’ be become completely irrelevant. Certainly here, in these Venetian Concertos he shows how he can muster all the athleticism, velocity and finesse of a composer ready to burst upon the baroque scene. But like the rarest of his breed – an acolyte of Vivaldi or Corelli, say – his work already has a far-seeing quality that raises him to the status of a musician’s musician." "Chesky has taken this Baroque form and its musical spirit into the 21st century with some very imaginative rhythmic and harmonic twists, and some very clever, well…mutations. You may get the impression initially that you're listening to an updated take on the Baroque, but then evolutionary activity of various sorts occurs and the music enters into an almost otherworldly place that is part-modern, part-Baroque and part-weird. It's all quite engaging and imaginative music that is accessible for most listeners. I highly recommend this disc to those looking for something quite new and bold, but very accessible as well." 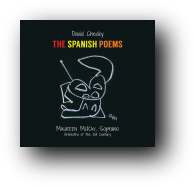 "David's latest work is "The Spanish Poems," for soprano and orchestra. Extravagant harmonies characteristic of turbulent contemporary music, combined with Latino rhythms. The vocal parts resemble the songs of Xenakis, and Maureen McCay shines with her soprano in a wide vocal range." "Being a high-driving New Yorker, Chesky indulges in his fair share of handclaps, snappy rhythms, and high pitched rings of all kinds. Play the songs a few times through, and you will likely find it hard to get the rhythms out of your head. Not that you'll want to. Fun stuff, and only a few clicks away." "Piano Concertos 2 & 3"
“It seems clear to me now that in future centuries he will be remembered and honored primarily for his distinctive, catchy, and brilliantly conceived compositions...this is a must-own, as far as I’m concerned." "Chesky’s style and technique have been fully mature for decades, yet his music gets better and better. These new concertos manifest the composer’s most fundamental principles--a love of the pace, energy, and noise of a big city, and a sense of connection to earlier music...The piano parts are quite demanding and Chesky himself is the able soloist." "This music sounds like Prokofiev on acid. This is difficult music played with great panache by soloist and orchestra." "Chesky's fugal writing and counterpoint add extra life to a non-stop experience that could leave some holding on for dear life." "Chesky like no other composer I know, can capture in the score, the pulse of the metropolis, the pace of life, and references to history. A collision of atonal harmony in counterpoint. These extremely dynamic and expressive works puts your ears at attention with their changing pace, rising and falling waves of emotions that raise your level of adrenaline." "Inspired by the chaos of New York City, the concertos are extremely high-energy works written and played at an impressive level of excellence. Composer/pianist Chesky’s style is a fusion of the many influences in his creative life. It’s all there: classical music, rock, jazz, Latin strains, traffic chaos, etc. The elements are beautifully conceived and drawn into a contemporary tapestry that incorporates many familiar threads. The result is a music that is at once recognizable yet exhilaratingly modern. Chesky’s ability as composer, orchestrator, performer and producer are remarkable. It’s an incredible disc that makes a lasting impression." 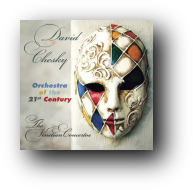 The revolutionary evolution of David Chesky as a composer and a pianist from his earliest years as a performer to the years 2016 and 2017 when he wrote both the Venetian Concertos and now these Piano Concertos 2 & 3 seems to have reached a new high water-mark of a neo classical style that bestrides a period from the baroque to the “school of music” without a tonal centre as first evidenced Franz Liszt’s Bagatelle sans tonalité of 1885, but more properly music of the twentieth century harmonic atonality began to be applied to pieces, particularly those written by Arnold Schönberg and The Second Viennese School. Concerto No. 2 and Concerto No. 3 for Piano and Orchestra together are among Mr. Chesky’s most original and entertaining works. Conceived to mirror not only the sonic universe, but also the ambient musical topography of New York itself, the works are built around the collision of conflicting personalities – created by the multi-ethnic language that constantly echoes in the underbelly of New York like an incessant drone. The score that pits Mr. Chesky’s ears “against” the backdrop of the aural universe of the city is heard in the juxtaposition of the contrapuntal voicing of Mr. Chesky’s piano and the “drone” of orchestral strings, with orchestral percussion that creates the colourful diphthongs that provide the dramatic accents that add the stresses and relaxations of this Babelesque aural palette. But let’s not forget that Mr. Chesky is, at heart, a musician immersed in the sonic universe of Jazz. This is why in the denser movements of “Concerto No. 3” his piano arrives to be integrated into the orchestra sounding like a baroque concerto gone mad. The rhythmic pulse generated by the tuned percussion (xylophone) in movement 2 of the “No. 3” marks time in a museum at a fascinating moveable exhibit seemingly made up of clockwork instruments all running at different speeds, like an assortment of feet shuffling on sidewalks and on streets as if to continue in the vein of his imagined metaphor of “a sonic collision in multi-cultural New York”. The complexes of what seems like simultaneous musical events – announced by the stabbing rhythm of this music in the finale of movement 3 of the No. 3 makes for a most dramatic manner in which Mr. Chesky and his piano accelerate to a vanishing point in his musical universe as the effusive lyricism of his composition builds to a crescendo against complex pulses like an insane metronome from which piano and the rest of the orchestra surge to the dénouement of this vivid music."